100sareepact | The ‘TWIN’ Drape !! 80/100 #100sareepact is perhaps one of the craziest stories of my sareepact series !! My cousin sister stays in London and she has twin daughters… she follows my saree stories and being a designer herself suggests inputs. 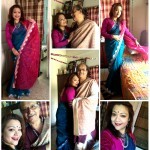 Since she was planning to come to Kolkata by December, we both came up with this idea of ‘Twin Drape’! But to my surprise, my craziness crossed all barriers when I customized this saree for this special story. Yes, for obvious reason the saree became a 50:50 combination of Orange & Pink, while the borders, blouse presented the Brown touches. My friend, designer Piya was very happy to create a design with such an uncommon colour combination, and after hearing the reason she was supperr excited! The dark wall at the sister’s place became the natural background; the orange & pink neck-pieces, and same combinations of lipstick (literally orange and pink) completed my look. 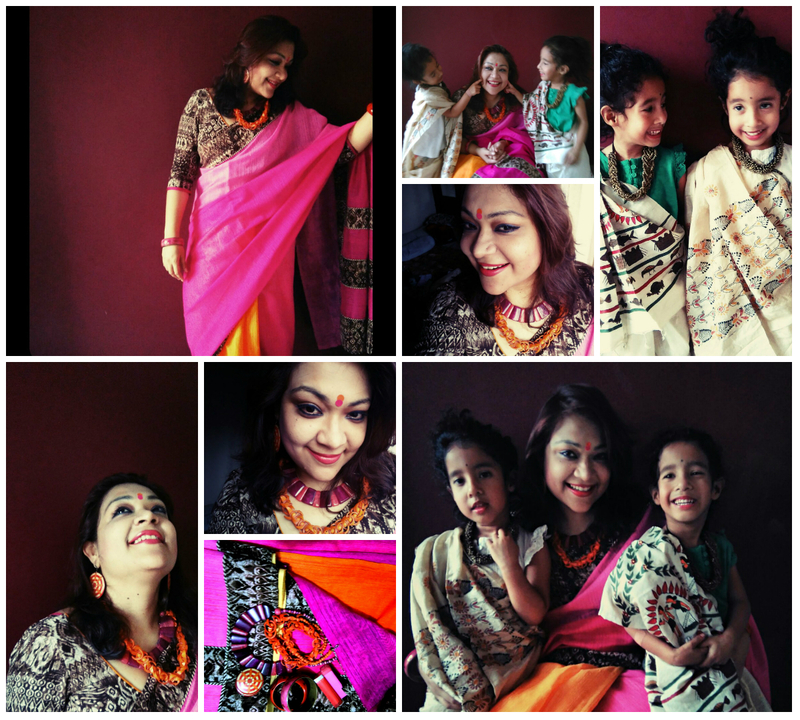 The cute twins draped my dupattas as sarees; one Kantha the other with Madhubani work…. Friends, just check these candid shots. Thanks to their evergreen mom, my Sis for their make-up and quick hair-do…. lLast PTM of my daughter….